Using NASA's Chandra X-Ray space telescope, astronomers have discovered one of the smallest supermassive black holes in middle of an unlikely host galaxy. The little monster was spotted in NGC 4178, a spiral galaxy about 55 million light-years from Earth that is quite flat and lacks a concentration or bulge of stars at its center. Theoretical models had predicted that bulges are necessary for supermassive black holes to form and grow. But the new observations from NGC 4178 and four other bulgeless galaxies where black holes have previously been found challenge these assumptions and suggest more than one mechanism is at work in forming supermassive black holes. Researchers have speculated that these behemoths could feed on the disks of galaxies or the haloes of mysterious dark matter that surround galaxies instead of a cluster of stars at the center. The newly discovered black hole has a mass that is estimated to be less than about 200,000 times that of the sun, putting it on the low-mass end of the supermassive black hole range, the researchers said. Of the four other black holes in galaxies without a bulge, two have masses that may be close to that of the black hole in NGC 4178. The black hole is located in the middle of the spiral galaxy NGC 4178, shown in this Sloan Digital Sky Survey image. The inset is a Chandra image showing an X-ray source at the position of the black hole. 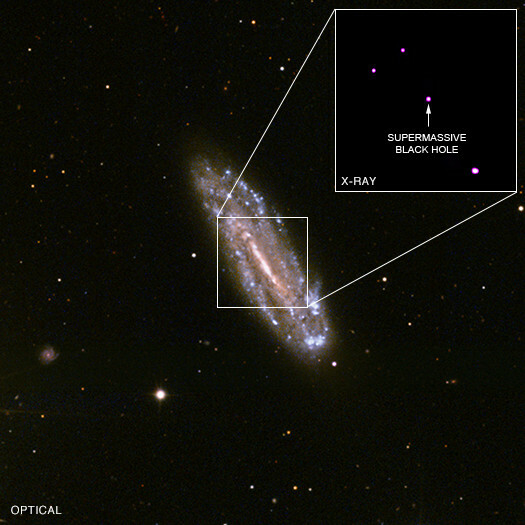 Based on the properties of the black hole's X-ray source in the Chandra image, the researchers think the black hole in NGC 4178 is rapidly sucking in material from its surroundings. The team, led by Nathan Secrest from George Mason University in Fairfax, Va., also thnks light generated by this infalling matter is heavily absorbed by gas and dust around the black hole. The researchers also found three other X-ray sources in the Chandra image, the brightest of which may be a medium-size black hole with a mass about 6,000 times that of the sun. The research is detailed in the July 1, 2012 issue of The Astrophysical Journal. In February, <a href="http://www.nasa.gov/mission_pages/stereo/main/index.html" target="_hplink">NASA's STEREO probes</a>, two observatories that were launched in 2006 to survey the sun, reached opposite ends of the sun and thus, were able to give scientists (and the rest of us!) a never-before-seen view of the far side of the star at the center of our solar system. The composite image above was captured on June 1, 2011, <a href="http://www.nasa.gov/mission_pages/stereo/news/farside-060111.html" target="_hplink">and according to NASA</a>, "is the first complete image of the solar far side, the half of the sun invisible from Earth." 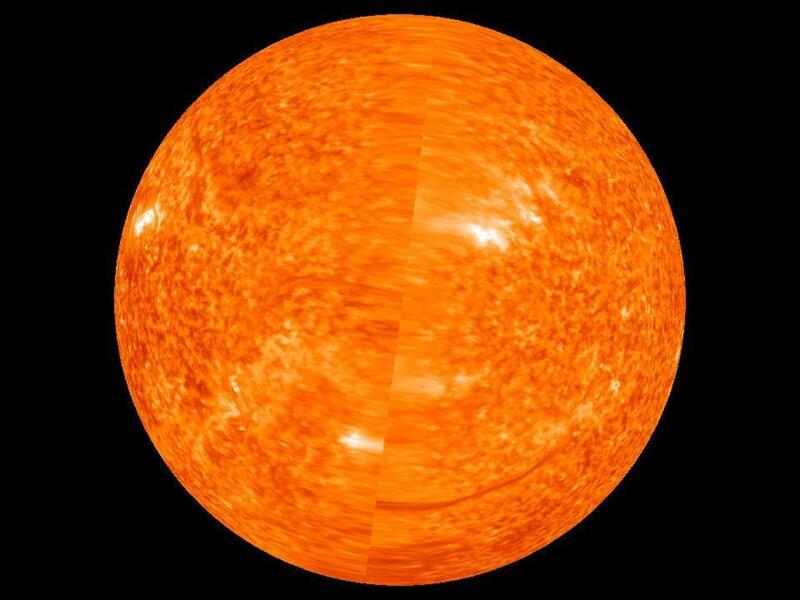 <a href="https://www.huffpost.com/entry/nasa-stereo-sun-images-video_n_819510" target="_hplink">Click here for more</a> on the STEREO probes.